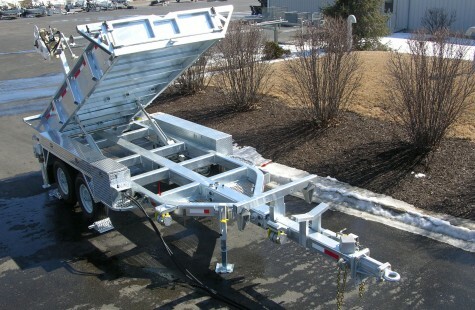 Bent-Tube Trailer Frames - Sauber Mfg. Co.
Why are bent frame tubes so important? Look at the frames on vehicle chassis. You will find very little welding. Even when structures like cross members need to be attached, it’s generally done with fasteners. Providing good welds is a necessary part of trailer building. Engineering out of welds where possible provides structural benefits and is an intelligent thing to do. It provides uniform strength throughout the frame by eliminating the stress concentrations common in the heat affected zone caused by welding. The welded area does not have the toughness that is inherent in a continuous bent tube frame. The weld area is difficult to inspect because the joint is hidden after it is welded. This is true for other welds as well but, in this critical area, there are unique challenges. An angled cut is required and the accuracy of this cut and the resulting joint can not be verified after the tube is welded. The tube walls should be beveled prior to the weld application and this cannot be determined after the fact without cutting the tube apart. The V-groove weld that results is difficult to ensure full joint penetration on the hidden base of the joint. Welding provides a discontinuous surface that is more susceptible to rust formation and this deterioration through time can affect the strength of the joint. Just as a casting can provide uniformity of shape and character, a bent frame does not posses the variability introduced by cutting, beveling, bending and welding the joint.